London Theatre Company. Leslie Yeo plays Dr. Sloper in The Heiress, 1950. In 1951, a young actor-manager (Leslie Yeo), left post-war England -- and, with $30 in his pocket, brought 13 professional actors and a scenic designer across the Atlantic to the closest point on the North American shore -- St. John, Newfoundland. There, without sponsor or subsidy, he staged 26 different plays in 26 weeks and ended up the season with a profit. Over the next six years he firmly established Canada's first fully professional commercial regional theater. This is the story of that historic theatrical adventure its crises and its triumphs and the many lives it changed. Documents the rapid growth of the repertory theater movement and the dying days of the Music Hall in Britain* London Theatre Company In early October of 1951, eleven actors sailed from Liverpool on the HMS Nova Scotia and arrived in Newfoundland to form one of the first professional, resident theatre companies in St. John's. Rehearsing on the ship as they crossed the Atlantic, the London Theatre Company would go on to do over 107 productions between 1951 and 1957 - becoming the first weekly, professional, repertory theatre company in Canada. The London Theatre Company performed 26 plays every season, totalling 182 performances over six years. In the 550-seat auditorium at Bishop Feild College, the Company did plays such as Rookery Nook, a British farce, Ten Little Indians by Agatha Christie, an adaptation of Brontë's Wuthering heights, George Bernard Shaw's Pygmalion, Oscar Wilde's The Importance of Being Earnest, and classic works by Noel Coward: standard British professional repertory theatre material, but it was undeniably popular for the first few years. In his autobiography, A Thousand and One First Nights (1998), Yeo writes that: We were a little heavy on farce perhaps but drama, mystery, light comedy, broad comedy, romance and a tinge of the sensational were all represented, topped off by a Shakespeare and a musical revue to finish the season. (117) According to Yeo, St. John's audiences loved farce and heavy drama "rather like any repertory town" in England (150). The troupe of British actors Yeo brought with him in the first year included Oliver Gordon (who co-financed the venture with Yeo and Harry Reynolds), Rosemary Rogers, Sheila Huntington, Geoffrey Lumsden, Paul Williamson, Yeo's wife Hilary Vernon and Gladys Richards. Richards was a native-born Newfoundlander who had been working in the theatre in England. All the performers had extensive experience on the London stage as well as in repertory companies elsewhere. Yeo also brought his own set designer (George Paddon-Foster) and stage manager. That stage manager was John Holmes, who stayed in St. John's after the company disbanded and continued working in the theatre as well as writing for The Telegram and broadcasting with CBC Radio. The company of actors would change over the next five years, but Yeo, Vernon, Gordon, and Holmes stayed with the London Theatre Company for its tenure. Yeo also used whatever assistance he could get from the St. John's community. Ira Butler, the groundsman at Bishop Feild became the company's stage hand and an accomplished sound effects technician, and Art Noseworthy became the company electrician. Volunteers from Bishop Feild College (students and alumni) and from the Feildian Athletic Grounds Association worked as ushers, cloakroom attendants, and canteen helpers (the money from the canteen and the cloakroom helped pay off the Association's bowling alleys). Money was always a concern for Yeo and the company: some seasons they had to borrow furniture from people's homes to furnish the stage. In other years local businesses, such as Lever Brothers, would buy up blocks of tickets to keep the company afloat. The back room of Baird's department store became the company's carpentry and paint shop. Bowrings provided space for the ticket booth: prices ranged from .50 to $2.00 and a pair of seats for the entire season was $96.00 - about $800.00 in 2001 money. The first season in 1951 was a success. The top box-office hit was Tennesse Williams's A Streetcar Named Desire, but that play only barely surpassed the popularity of the Saturday matinée performances for children. 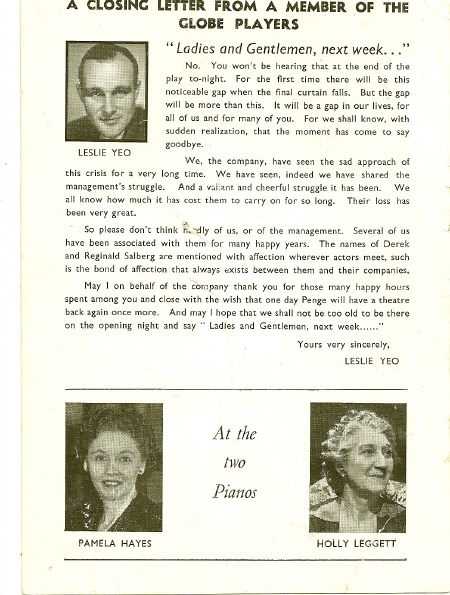 The season-ending musical revue, titled Screech, sealed the decision by Yeo and the company to not only return to St. John's in the fall of 1952, but also to expand the London Theatre Company's activity with a tour to Halifax. It was Yeo's hope that St. John's would become the hub for tours across Atlantic Canada and into Ontario. The tours to Halifax, Moncton, Sydney, London and Niagara Falls, from 1952 to 1956 went well, but were never as successful as the St. John's performances. Hilary Vernon, ca. 1952. Leslie's wife. Vernon, Leslie Yeo, George Paddon-Foster, and Oliver Gordon were partners in the London Theatre Company. The demands of travel forced Yeo to shorten the St. John's season (in 1956 the Company only did nine performances at Bishop Feild), and it became increasingly difficult to get actors to sign on for what was a lengthy and tiring touring season. These reasons, combined with the increasing influence and popularity of television, caused Yeo to decide to close the company after the 1957 season. The London Theater Company's final performance was Screech - The Last Drop on April 3, 1957 in St. John's. Johnny Belinda, ca. 1952. After breaking box-office records in St. John's in 1952, Johnny Belinda, starring Hilary Vernon and Charles Jarrott, did not fare very well the next year in Halifax. Some of the London Theatre Company stayed in Canada after the company closed down to develop long-running theatre careers. John Holmes remained in St. John's acting, directing, and writing. "Gilly" and Moya Fenwick, who joined the company in 1954, headed to Ontario and the summer theatre festivals there. Leslie Yeo would continue his career at Stratford and Niagara-on-the-Lake. The Company provided professional repertory theatre to enthusiastic St. John's audiences for six years, and when Yeo returned to St. John's in March 2001 to deliver a lecture on the London Theatre Company's history he and his players were still remembered. Sheila, i was looking through some old theatre programme from the Empire Theatre, Penge in South London which my Aunt collected at the time, and thought you may like these. Leslie passed away on September 14, 2006 at Toronto Grace Hospital, at age 91, after a mercifully short battle with cancer. Husband to Hilary (deceased) and to Grete. Father to Jamie. His career in theatre, television and film spanned nearly sixty years, and gave him the opportunity to work on three continents. In addition to his love for the theatre, Leslie had a passion for people, which led him to early involvement with ACTRA and ultimately to being a founding father of the Actra Fraternal Benefit Society - an accomplishment he was justly proud of. A celebration of his life will be held on Tuesday, September 19th at 2 oclock in ROSEDALE UNITED CHURCH, 159 Roxborough Drive. Grete and Jamie both wish to express their heartfelt thanks to the staff of Grace Hospitals Palliative Care Unit for their unending kindness, gentility and compassion in their care of Leslie. "I always have a wonderful time, wherever I am, whoever I'm with."